Sauté the onions and peppers in a large pan over high heat for several minutes, until they start to become soft. Meanwhile, cut the seitan into thin strips. Add the seitan to the pan. Turn the heat down to medium-high. Add 2 tbsp of water and the taco seasoning. Cook for another 5 minutes until most of the water has boiled off. Heat tortillas in the microwave. 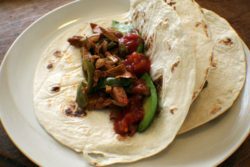 Spoon into tortillas and top with sliced avocado, fresh cilantro, and salsa of your choice.